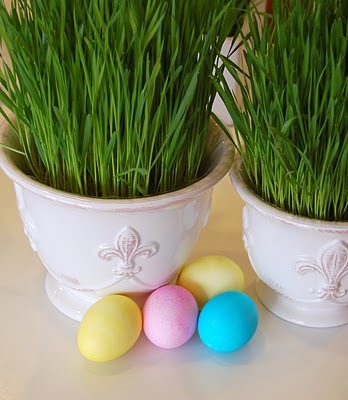 It's that time if you want wheat grass for Easter or St. Patrick's Day. 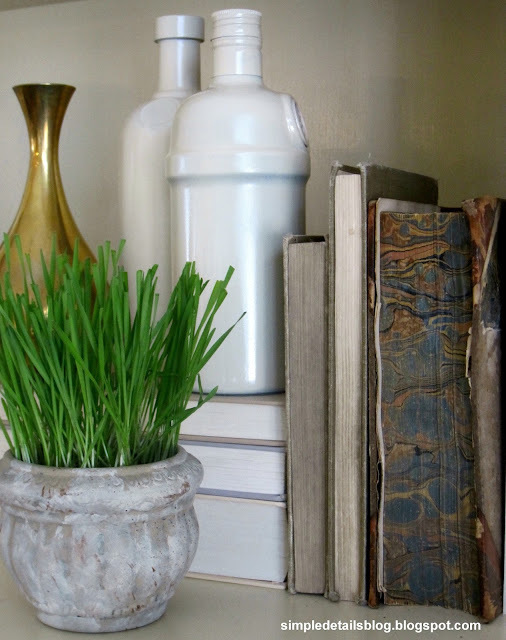 with lots of inspiration for containers and centerpieces. Ok, this one isn't new, but it's so pretty for Easter I had to include it! Plant several, big and small, you'll love having the fresh pop of green. I'm planning on using these cups at my Easter table. If you'd like to check out last year's post it's here. I love this, Pam! Thanks for sharing! 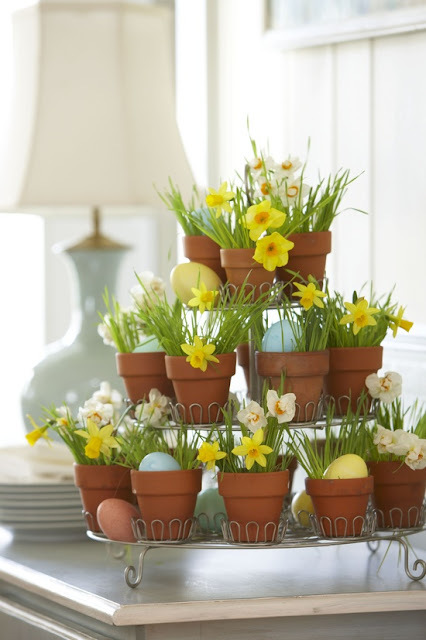 I like the daffodils on the tiered tray very much. I might have to copy that! These are adorable. I love the tea cups and the wooden box! Love that pop of green! Makes me think of Spring, which I can't wait for!! I've done this before and yes, you are so right, it's easy! Easter is so early this year, that I needed the reminder! Thanks! Last year, I planted regular grass seed and that didn't work out so well. 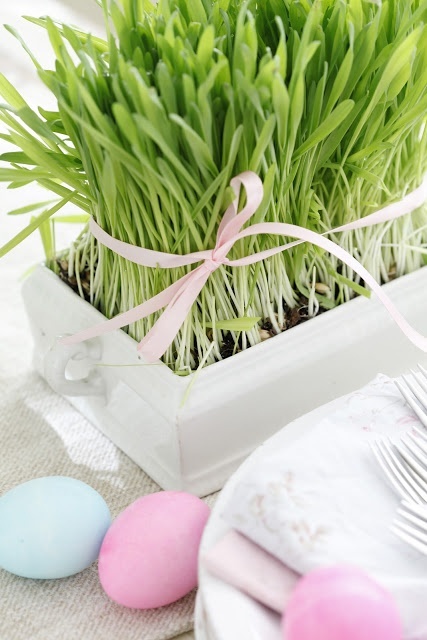 So maybe this year, wheat grass...or maybe I'll cheat and buy some already grown. ;) Going to check out your post from last year. Thanks for sharing the different looks. Love it! Okay question: can I use the seeds from last year? Have you ever done that? I bought a big bag of wheat seeds at Whole Foods last year and wonder if they'll sprout. I guess it's worth a try! Thanks for the reminder to get it going! I love the use of tea cups for your Easter table - so cute! Oh, this looks like fun! Thanks for the inspiration! Pam thanks so much for the reminder! I loved this idea from last year, but I had not thought of it yet!! 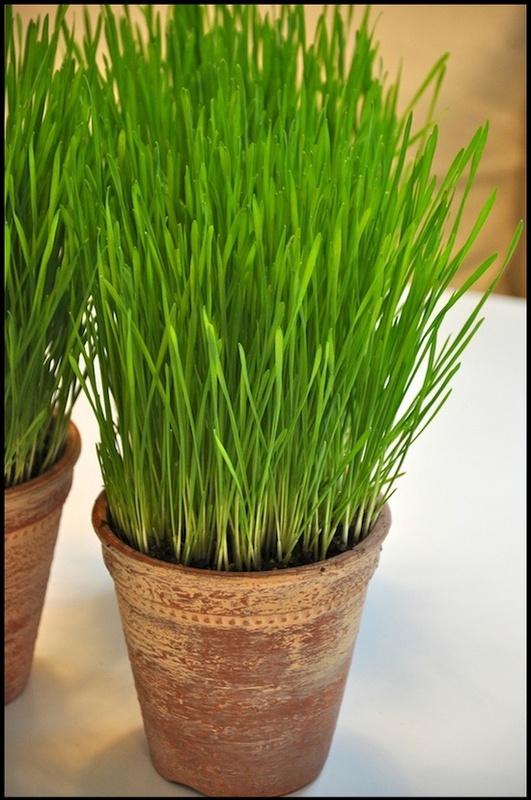 i love the look of wheat grass!!! so happy! I love the beauty and texture of wheat grass!...so many great ideas! Thanks Pam. I was waiting for this post! Our bag from last year is sitting out on the counter and Stephen asked when I was going to plant it- I figured I would wait until I saw you plant yours! ha! 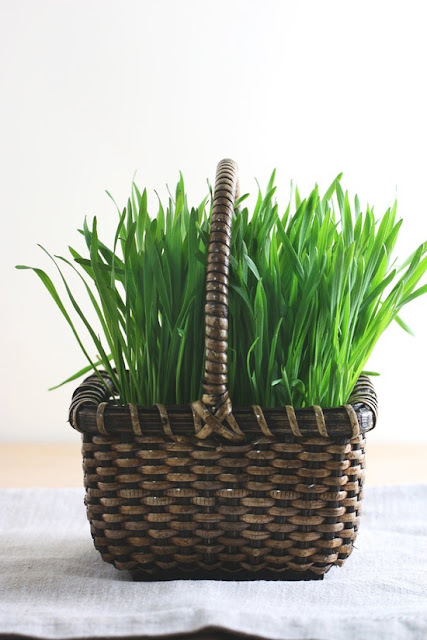 I was just thinking this week that I should grow some wheatgrass (actually, that's a lie...I was going to order some already grown in our produce box that we have delivered to our house every week), BUT then I had read that catnip grows faster....have you tried catnip in the past? Thanks for the reminder, Pam. The grass really is greener on your side! Yesterday you were Mrs. GreenJeans, today green grass--It must be Spring! Spring..you are on your way!! Can't wait to see your progress..
Love this idea....This would be fun for kids to do! So fresh and pretty! 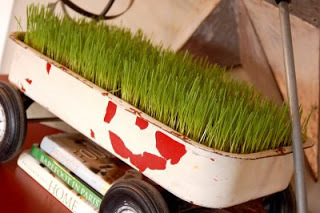 I have some wheat grass left from last year in the garage and will get planting, thanks for the prompt! Your table is going to look beautiful. Mikko is so adorable and the pot he is munching on is gorgeous with the thick grass! OH how pretty! We have a couple of varieties of wheat berries as we grind our own flour (sometimes...) so I think I'll just go ahead and see how well they sprout. Hmm now where is the potting soil we had around here. It will add a pretty punch of much needed green. Once again thank you for the reminder and all the pretty pictures! You are so organized to be doing this now. I have never tried to grow this. I love how it looks. Wow, your post is perfect timing! I was just thinking about wheat grass the other day. Thank you for sharing your tips. 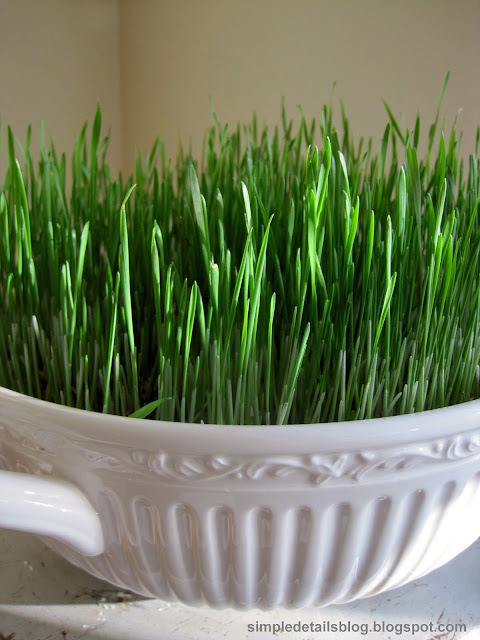 I'm embarrassed to admit this, but I never knew how wheat grass was grown. I even have some wheat berries in my cupboard. I'm definitely going to try this! I have the perfect vintage container for it too. oohh. 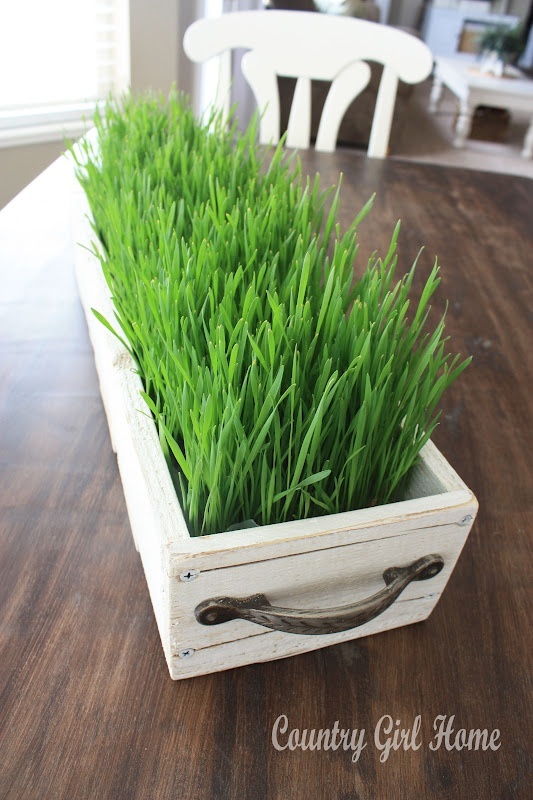 love the look of wheat grass. it's oh-so Spring. i always get it from a fresh market, but planting it is a fun idea. have a great week! I think I have to give this a try! Great ideas! I can't wait to see your Easter table.